(see this illustration for example, Azan tagging along with the group and all). Why haven't I seen that before? .... but I am moved to tears. There are many things you haven't seen. You already got something very very special! Amazing, thanks to everyone involved with this awesomeness. Grovel informed me the bookmark is coming along. So we should really start drawing up exactly how we're going to respond to Miura in the follow-up letter. I personally don't think we should be too overbearing this time. I really just want to thank him for spending the time to reply and give him some praise for the recent action in the series -- letting him know we're on board despite the many detractors that cropped up during the extended break. But even that may be a little too much . I really just want to say: "Miura, thanks." I do think a bigger thanks for him actually replying to you is more than welcome, actually. Most authors wouldn't even bother. Miura is special, we have to let him know just how much. Precisely. It should be brief and to the point and ask nothing in reply. "Um, Mr. Miura, please can I find out what happens to Skull Knight, Ganishka, Zodd, Rakshas and Femto?" Maybe you can send miura something with the thank you as well like some fan art done well in oil painting. We have already discussed this, agreed on something and it's being done at the moment. Grovel informed me the bookmark is coming along. Bookmark has arrived! Thanks to Grovel and his daughter for this masterpiece! This little thing is just awesome She did a great job maintaining the correct colors of the emoticons and of course the pixel-perfect job of recreating them in stitches. Now I just have to draft the response letter and it and this amazing gift will be off to Miura, where he will hopefully use it in the future. Wow thats amazing! Nice job and Thank you Grovel!! Here's what I have so far for the reply letter. The members of Skullknight.net and I would like to express our extreme gratitude for the effort spent in answering our questions. Mr. Shimada, your gracious reply was certainly more than we expected, and we were truly humbled by it. We would like to take this chance to congratulate Miura on his achievement in the series recently. We are simply breathless over the direction Miura has taken Berserk. I've been reading it episodically since 2000 and this is one of the most exciting periods I can recall. Simply outstanding work. You perpetually have us on the edge of our seats! As a show of our respect and admiration for Miura's work, we have attached a bookmark the daughter of one of our members created for him. It features six of the emoticons we made for the forum here. We hope you find a good use for the bookmark and enjoy the emoticons! Anything more to add? Anything to take away? We would like to take this chance to congratulate Miura on his achievement in the series recently. We are simply breathless over the direction Miura has taken the series recently. I've been reading Berserk episodically since 2000 and this is one of the most exciting periods I can recall. Simply outstanding work. You perpetually have us on the edge of our seats! You might want to take one of those out to make it a bit smoother. 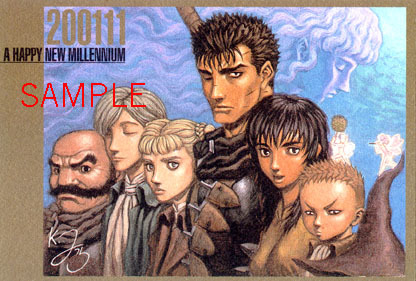 I'm sure Miura will really enjoy the bookmark. Hehe yeah, I just caught it as well. Just a remnant from a rewrite. Fixed! Thanks guys, for doing so much, I think the letter looks good. Sounds good to me right now. It gives me the impression that Mr. Shimada had a lot to do with getting a response for SK.net's letter and yet this new letter only includes a present for the big guy, to me that could be taken as a little rude, maybe. Or maybe I'm just crazy. I think Mr. Shimada will understand, thats his job. He doesn't write Berserk, Muira does. Ok then I consider it done and I just need to request Puella to translate it when she can find the time. Pleeeeeease Puella?